Native American Heritage Month lets us reflect on Ideum’s exciting collaborations with Native American artists and educators. Each November, Ideum celebrates Native American Heritage Month to recognize the achievements and contributions of indigenous Americans to our shared community and future. We are proud to honor New Mexico’s 23 Native American tribes who have profoundly shaped the history, landscape, and culture of our southwestern home. We are particularly honored to have opportunities to work with tribal museums, organizations, and artists and are committed to amplifying their voices and stories. This November, we are glad to reflect on a selection of these projects. 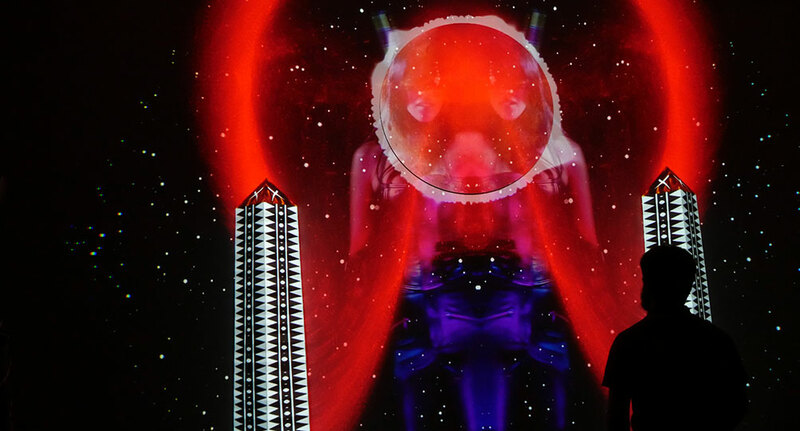 Ideum teamed with Cochiti Pueblo artist, potter, and fashion designer Virgil Ortiz to create a projection mapped installation as part of Ortiz’s ReVOlution: Rise Against the Invasion exhibition at the Colorado Fine Arts Center in Colorado Springs. This immersive exhibition fuses traditional Cochiti art with Ortiz’s futuristic works to tell the story of the Pueblo Revolt of 1680—and takes visitors into the future for the Revolution of 2180. 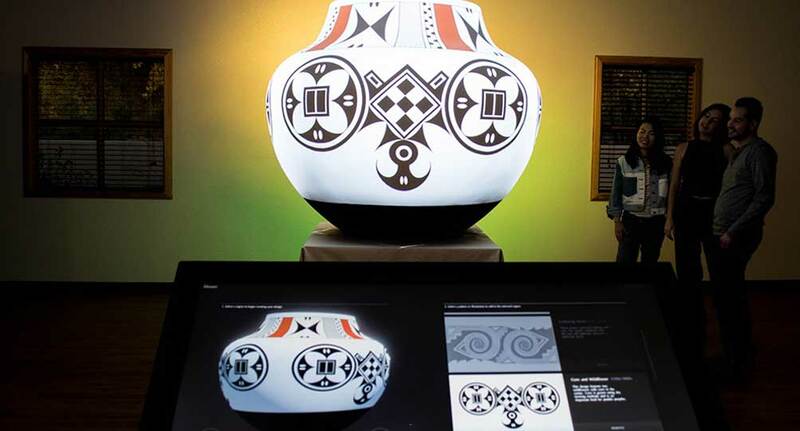 The Exploring Pueblo Pottery project uses cutting-edge technology and innovative experience design to shine new light onto ancient motifs. Ideum worked closely with UNM instructor and potter Clarence Cruz and Acoma Pueblo artist Michelle Lowden to design an experience that allows users to investigate these intricate designs, discover how they highlight important elements of Pueblo life, and learn about the art, history, and culture behind their creation. Ideum worked closely with the National Museum of the American Indian and scholars from the University of Tarragona to create a 3D reconstruction of the ancient Inka capital city of Cusco as it looked in the year 1531. Ideum programmers and 3D artists with help from XY3D built the experience based on years of painstaking archaeological and architectural research. Ideum Creative Director Jim Spadaccini traveled to Peru with the Smithsonian team to participate in the gathering of media for the exhibit. 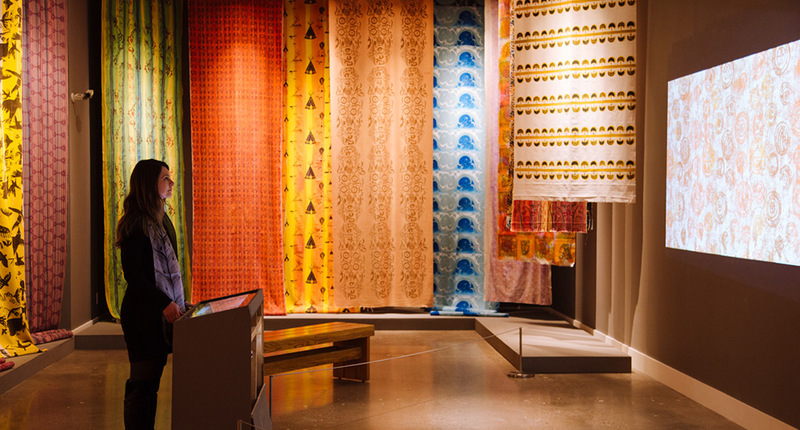 Ideum collaborated with the Institute of American Indian Arts and the Museum of Contemporary Native Arts on an interactive exhibit for their Lloyd Kiva New textile exhibition. The interactive features both a textile collection viewer and a textile creator. The collection viewer features textiles created by IAIA students during the 1960s and 1970s under Lloyd Kiva New’s direction. The textile creator takes elements of these designs and allows users to digitally experience the printmaking process via the touchscreen and a projection wall.